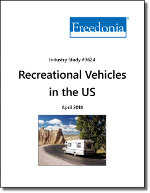 This study analyzes US demand for recreational vehicles by product and region. Additionally, the study analyzes aftermarket accessories for recreational vehicles. Travel trailers include conventional and fifth-wheel types. Motorhomes include class A, class B, and class C motorhomes. Campers and camping trailers include folding camping trailers and truck campers. These vehicles are designed to provide temporary living quarters for a variety of recreational, travel, camping, or other seasonal applications. Aftermarket accessories for recreational vehicles, which include navigational and electronic systems as well as other components, are discussed separately. Conversion vans, personal off-road vehicles (such as ATVs, snowmobiles, and dirt bikes) and manufactured housing for long-term residence (including park trailers and mobile homes) are not included in the scope of this study. Historical data for 2007, 2012, and 2017 and forecasts for 2022 are provided in current dollars (which are not adjusted to account for inflation) for demand, manufacturers’ shipments, and imports and exports for aggregate recreational vehicle products. Demand and current dollar shipment information is also given for each product classification at the manufacturers’ level (unless otherwise specified) and, for many key product categories, demand is also provided in unit terms. Data provided for accessories reflects only those items that are sold separately to the consumer in the aftermarket. Factory-installed accessories or those included in a recreational vehicle package are considered with the RV.